TAHLEQUAH, Okla. – The Cherokee National Youth Choir is releasing a new Christmas music CD and will be performing songs from it at two concerts in November and December. “Cherokee Christmas” can be purchased at all Cherokee Gift Shops, at the concerts or by calling CNYC Co-Director Kathy Sierra at 918-453-5638. The CD has 12 songs that were recorded this past summer. “We are doing all styles of music from ‘Up On the Housetop’ and ‘Silver Bells’ to ‘O Holy Night, ’” CNYC Co-Director Mary Kay Henderson said. This is the third Christmas CD the choir has recorded. The previous one, “Comfort and Joy, ” was released in 2006. The choir’s CD release concert will be at 7 p.m. on Nov. 17 at the Oklahoma Music Hall of Fame at 401 S. Third St. in Muskogee. This event is free and open to the public. A second concert will be at 7 p.m. on Dec. 15 at the Wagoner Civic Center located at 301 S. Grant in Wagoner. Tickets are $5 and can be purchased by calling 918-485-3414. The choir also will be performing on Dec. 5 at the lighting of the Courthouse Square in Tahlequah. The CNYC is made up of 40 Cherokee youths from northeastern Oklahoma communities. Members perform traditional songs in the Cherokee language. It was founded in 2000 as a way to keep Cherokee youths interested in and involved with language and culture. “I have been with the choir since 2003. I love the kids. Kathy (Sierra) started with the choir in 2000 as a parent and has been with them ever since, ” Henderson said. She said the choir gets requests “literally every day” to perform somewhere in the area. Auditions for new choir members will be held Jan 5. Candidates must be in sixth through 11th grade, a CN citizen, willing to learn Cherokee and attend weekly rehearsals. Interested youth should call Sierra at (918) 453-5638 to schedule an audition time. 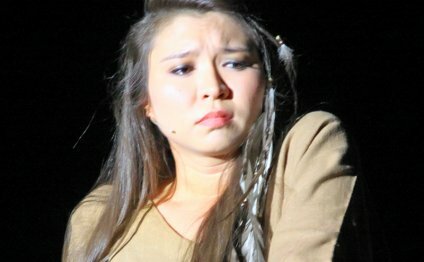 Interest in the Cherokee language has been rekindled among young people largely through the success of the youth choir. Several area schools now use the choir’s CDs as learning tools, and other schools are interested in developing curriculum to teach Cherokee language and music. People may listen to samples and purchase CNYC music at iTunes by searching the music section with the phrase “Cherokee National Youth Choir.” The choir’s CDs are also available on amazon.com. Will lives in Tahlequah, Okla., but calls Marble City, Okla., his hometown. He is Cherokee and San Felipe Pueblo and grew up learning the Cherokee language, traditions and culture from his Cherokee mother and family. He also appreciates his father’s Pueblo culture and when possible attends annual traditional dances held on the San Felipe Reservation near Albuquerque, N.M. He enjoys studying and writing about Cherokee history and culture and writing stories about Cherokee veterans. For Will, the most enjoyable part of writing for the Cherokee Phoenix is having the opportunity to meet Cherokee people from all walks of life. He earned a mass communications degree in 1993 from Northeastern State University with minors in marketing and psychology. He is a member of the Native American Journalists Association. Will has worked in the newspaper and public relations field for 20 years. He has performed public relations work for the Cherokee Nation and has been a reporter and a photographer for the Cherokee Phoenix for more than 18 years. He was named interim executive editor on Dec. 8, 2015, by the Cherokee Phoenix Editorial Board. CATOOSA, Okla. – On June 4, the legendary singer Patti LaBelle will perform at The Joint inside Hard Rock Hotel & Casino Tulsa. Before her solo career, LaBelle was the lead singer of the group LaBelle, with fellow songstresses Sara Dash and Nona Hendryx. The trio released such hits as “I Sold My Heart To The Junkman, ” “Isn’t It A Shame” and the iconic disco song “Lady Marmalade.” After the band dismembered in 1976, LaBelle continued to serenade her fans by belting out the classic rhythm and blues renditions, pop standards and spiritual sonnets that LaBelle is known and revered for. LaBelle’s catalogue of hits include “If Only You Knew, ” “New Attitude, ” “Stir It Up, ” “Feels Like Another One” and the No. 1 hit “On My Own.” In 2009, she reunited with Dash and Hendryx for the first time in 30 years for the critically acclaimed LaBelle reunion album, “Back to Now.” In addition to her success as a singer, LaBelle has also found success as an author. LaBelle has released five books, including the autobiography “Don’t Black the Blessings” and three cookbooks. Her most recent work is her line of signature sauces and marinades, called Patti’s Good Life, as well as launching a designer bedding collection, Patti LaBelle Home. Tickets go on sale on April 23 and start at $55. For more information, call The Joint box office at 918-384-ROCK or visit www.hardrockcasinotulsa.com. CATOOSA, Okla. – The rock ‘n’ roll band Whitesnake, founded and formed by Deep Purple singer David Coverdale, is kicking off their 2015 “The Purple Tour” on Aug. 13 at The Joint inside Hard Rock Hotel & Casino Tulsa. The tour features their biggest hits and songs from the new tribute album. Having spent 2013 touring the world on the second leg of the “Forevermore World Tour, ” 2014 was spent in the studio recording the 12th studio opus. Once again, fans are about to be surprised by the ‘SNAKE as they hit the road in 2015. After leaving Deep Purple in 1976, Coverdale formed the original Whitesnake in 1978. Coverdale then began a journey that has taken him from the early heavy blues rock of the late 70s, with albums like “Trouble, ” “Lovehunter, ” “Ready An’ Willing” and “Come An’ Get It, ” through to the explosive hard rock of the revamped ‘SNAKE sound with the multiplatinum “Slide It In” and 1987’s self-titled mega-million-selling smash-hit album “Whitesnake.” The iconic band consists of vocalist David Coverdale, guitarist Reb Beach, guitarist Joel Hoekstra, bassist Michael Devin and drummer Tommy Aldridge. Tickets go on sale on June 8 and start at $45. For more information, call The Joint box office at 918-384-ROCK or visit www.hardrockcasinotulsa.com.